Pet health care involves a good number of procedures one of which is Exercise and Fitness workouts. Your pet needs this kind of activity to keep fit or to recover its fitness when it has been ill for a while. At Safari Vet, we offer a robust fitness work out for your pet through our Animal Rehabilitation Services. Pets mostly require fitness workouts when they have been living a sedentary lifestyle for a while. As stated earlier, this condition could have been caused by unavailability of the pet owner to engage the animal, ill health or just being over-weight. Whatever the cause of your pet’s poor fitness or ill health, proper fitness therapy can get it back on its fit in a few short weeks. 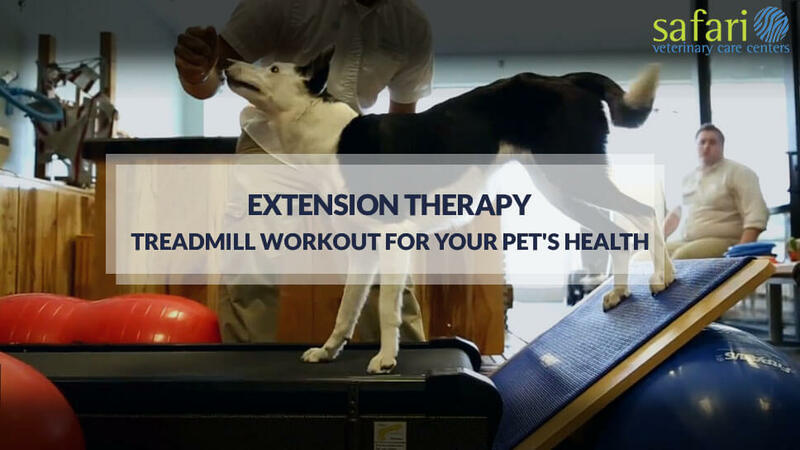 Safari Vet, League City, Tx offers an extension therapy program which involves rehabilitating your pet through a dedicated treadmill workout aimed at strengthening your pet’s legs. These programs have been tested and proven to be effective in improving your pet’s physical fitness. Just like in the video below, a pet dog gets trained on the treadmill to strengthen its hind legs. As you can see in this video, the dog’s forelegs are kept on the treadmill while the hind legs are placed on an unmoving surface. At first, the dog finds it difficult to walk on its front legs as it legs remain on the stable surface, but with constant attempts, the dog finally gains confidence and gets into the flow of the treadmill work out. The aim of doing this is to exert pressure on the hind legs of the animal as it tries to walk with only the forelegs. This activity is not only for fitness purposes but also therapeutic. Pets recovering from debilitating ill health will find these exercises rehabilitative and therapeutic. We are certain that your pet will gain improved limbs when it undergoes this therapy no matter how badly affected it previously was. It will only take time, patience and a skilled animal therapist who knows what they are doing. Any pet can be trained to carry out this animal physical therapy. All it will take to get started is a patient and dedicated veterinary personnel who has the experience and skill to deliver the needed training. Dog physical therapy like the one in the video is very useful in increasing the range of motions of a pet’s hind legs. These exercises can make your pet fit and far more athletic than other pets in the same class. Pets used for competitions will benefit from this therapy as they are likely to be fitter and healthier in general. If you are looking for a wonderful but affordable pet clinic near you that can be of assistance with this therapy, Safari Vet is highly recommended. Now, let’s discuss another aspect of animal extension therapy involving the use of an underwater treadmill to rehabilitate and heal wounded or sick pets in recovery. The underwater treadmill is basically a treadmill inside a compact pool of water. The pet undergoing the therapy is made to walk on the submerged treadmill in the water. The buoyancy of the water makes the animal lighter so it can walk with less stress on its healing limbs while the walking itself helps it regain strength in the affected parts and build confidence in using them. Safari Vet is one of the top performing League City Animal Clinics to check out as far as Pet Physical Therapy which includes Dog Physical Therapy, and other procedures are concerned. Our expert in-house veterinarians are highly skilled, talented and have gained a whole lot of experience handling a variety of animal types to know exactly how to provide this therapy to your pet. Does your pet need rehabilitative pet therapy to improve its limb movement or regain its physical fitness? You will need a professional pet therapy clinic that has been in this field for a while and can deliver on their promise of rehabilitation. Contact Safari Vet, League City TX to know more about rehabilitation for your pet’s health!